So, do you think this guy is somehow related to the weird radiation found in the water that caused Airtight to be sent to Brazil? We say "yes." Cesspool was the Chief Executive Officer of a huge multi-national corporation with vast holdings in oil refineries, chemical plants, and mills. In a effort to placate environmental groups, he took them on a tour through one of his chemical plants, where an accidental exposure to the toxic waste left him horribly disfigured. 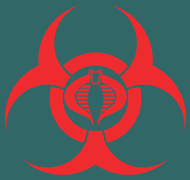 For reparations, he took his knowledge of high-level dirty dealings and corporate subterfuge straight to the Cobra Organization. He soon created a weapons grade Plasma-Tox and portable dispersal system. However, he found the long-term exposure turned some of his men into uncontrollable creatures. He was eventually caught by the GI Joe team and incarcerated for many years. Oh, now that's interesting! 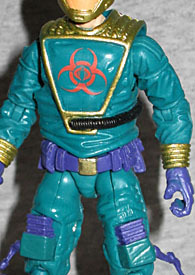 We were first introduced to "Compound Z" with Poc City Strike Cobra Commander - he had a canister of the stuff, as well as a clear case containing the mysterious element it was made from. We next saw it with the Hazard-Viper, who was carrying jars of it and seemed to have a spray gun full of it. Finally, there were the Zombie-Vipers, the fully infected victims. Fans drew comparisons between the G3 Hazard-Viper and the G1 Toxo-Vipers, and then between the G3 Zombie-Vipers and the G1 Toxo-Zombies, but it was just speculation; this filecard has just made the connection official, drawing a straight line from the Plasma-Tox used in Generation 1 to the Compound Z of today! Back in 1991, Cesspool wore more of a costume than a uniform. He had a golden robot arm, armor on the shoulders that were somewhere between shoulder boards and full pauldrons, a thick aiguillette on his left arm, and a 3D Cobra logo on his chest that was even bigger than the ones on any of the vehicles - kind of a crazy mess. This new one is a bit more reserved (apparently his time in prison mellowed him out, slightly), but still keeps the feeling alive. He's built from Sci-Fi's legs and helmet, Airtight's arms, and the Techno-Viper vest. So it's not a direct update of the old look, but it's very close. And if you miss his robot arm, pretend it's just inside his suit right now. Cesspool's real name is Vincent D'Alleva, and he was based on a real guy. The new head, by Boss Fight Studios, doesn't keep that likeness, but it does make his horrible scar even more disgusting than it used to be. A big red gash running vertically down his face has always been the character's trademark, but here it really looks like hideous, melted flesh. Well done! 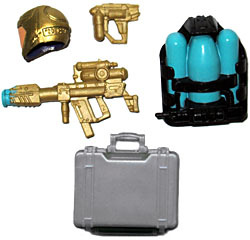 In addition to the Sci-Fi helmet (painted gold with an orange faceplate, just like Cesspool's vintage accessory), he also includes Barbecue's backpack, and the two guns that came with the PoC Arctic Threat Destro that no one ever bought. The guns are gold, and the larger one has some bright blue Compound Z splatter at the tip, matching the color of the tanks on his back. The set includes a black hose to connect the backpack and gun, but the peg on the pack is smaller than the peg on the gun, so the hose can't fit them both. You'll probably just want to ignore it. As befitting a CEO, he also comes with the briefcase full of money that City Strike Destro introduced. Still an awesome piece. The card art for Cesspool was (like fellow Newton, MA native Wide Scope) done by Adam Riches, and he looks spectacular. The Vinnie D'Alleva likeness is maintained here, and is super strong - he looks like a raving loon, but he looks like the real guy (other than the facial wound, where it looks like his skin is sloughing off to reveal a monstear beneath). The pose is kind of ridiculous, but it's a direct update of the original card art, just redone with all the modern costume elements and accessories. Again, this is terribly skilled work. 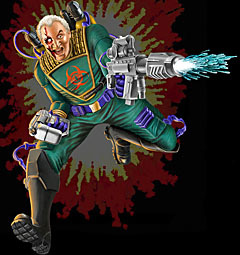 When Hasbro presented the character designs for Cesspool to Larry Hama, he was tentatively known as "Oil Baron" - a name which, Hama rightly pointed out, conjures up images of JR Ewing more than a scarred-up biker. He definitely came up with a workable angle for the Cobra CEO (Chief Environmental Operative) though. Yes, it's a very Captain Planet-ish angle, but it was the '90s; that's what we got back then. And by tying him into their Compound Z storyline, Hasbro has rescued him from being tied to one specific era of storytelling (and, uh, tied him to a different specific era of storytelling). Plus, this year's Joe Con convention set is zombie-themed, so consider Cesspool a sneak peek. A really cool sneak peek.